The Doctors Fox will be waving goodbye to the ambivalent weather, obnoxious sports fans and passionate music lovers of the East coast in exchange for...well, more ambivalent weather, obnoxious sports fans and passionate music lovers, but in the Midwest. 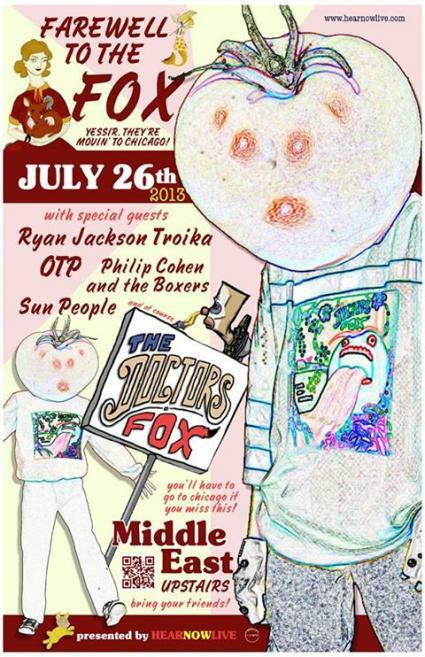 This Friday, July 26, the band will be playing a farewell show at Middle East Upstairs in Cambridge, MA. The band will be relocating to Chicago, and taking their upbeat folk-pop with them. I’d be more upset about this, but at least I know that their songs will now be spreading joy all around the shores of Lake Michigan. The band will share the stage with a slew of other local acts, including Ryan Jackson Troika, OTP and Philip Cohen & The Boxers. NYC-based Sun People will also be joining in the festivities. Doors open at 8PM; $10 advance tickets, $12 at the door. Proper ID required. Check the band’s Facebook page for more details.